The Mission of William Lyon Mackenzie Collegiate Institute is to provide, in collaboration which staff, students, parents and community, challenging programs and a high standard of excellence that meet the needs of all students. As a step towards the fulfillment of this mission, our staff is determined to provide a safe, harmonious school where all people – students, teachers, support staff and the community – can work and learn. We believe that meaningful and challenging programs are essential to providing a clear focus for all members of the school community. We also believe that any social organization benefits by having a set of explicit common principles and understandings which help to define appropriate behaviour of individual members in order to enhance peaceful co-existence within the organization. Such a set of common understandings can help support students to become responsible, self-directed lifelong learners. The information contained in Mackenzie’s Code of Behaviour outlines a set of common understandings. They are the result of thoughtful discussion among staff, students and parents and are intended to safeguard the positive, healthy learning environment for which Mackenzie is known. Mackenzie’s Dress Code strives to be consistent with both the spirit and the letter of the Canadian Charter of Rights and Freedoms and the Ontario Human Rights Code, the Toronto District School board’s Equity Foundation policy, the TDSB Appropriate Dress Policy and School and TDSB Code of Conduct. The School Dress Code is intended to promote fairness, equity, inclusion and school safety. Students should wear clothes to school that make them feel comfortable and confident. The dress code must be flexible enough to provide accommodation for religious dress. Subject-specific clothing is sometimes required in specific classes. For example: art, business, dance, phys-ed, science, and tech classrooms. Hats, Hoods and non-religious headwear are prohibited. Outdoor jackets and sunglasses are not permitted to be worn inside the school. These measures ensure that Mackenzie students are easily identified inside school. Language and/or representations on attire that depicts violence, profanity, racial or gender discrimination or discrimination of any kind whatsoever, or that otherwise demeans an identifiable individual or group are prohibited. It is expected that every student in the school will comply with the school dress code. Follow-up for not complying with the dress code may include support, counseling, parent notification and/or progressive discipline. The principal is permitted to exercise discretion to allow exceptions to the School Dress Code. Contributing to a positive school environment begins in the morning. All students, including students who are late for class, are expected to stop, remain quiet and show respect for the National Anthem, Acknowledgement of Ancestral Lands/Territories and the morning announcements. Mackenzie provides its students with incredible opportunities outside the classroom. These opportunities are supported by funds raised through the Student Activity Free. For the 2017-2018 school year at Mackenzie, we will be collecting an activity fee of $75.00. The fee breakdown includes $20.00 for a school yearbook, and $5.00 for a school agenda. The remaining amount supports: Student Council Activities, $15.00; Extra-Curricular Activities, $15.00; Guest speakers, $5.00; and School Clubs, $15.00. The Mackenzie Parent School Council supports this initiative. Student unable to pay the activity fee are asked to contact the main office. (2) Personal electronic devices may be used outside of instructional class time, as long as the use of these devices is compliant with the school code of conduct. Respect for resource materials (e.g. textbooks, library books, uniforms, A.V equipment, music equipment, computer equipment and software) is expected. Students who have lost textbooks are accountable for the cost of replacement. It is the policy of the Toronto District School Board that all buildings, sites and facilities are designates as non-smoking areas. Smoking cigarettes or electronic cigarettes is not permitted on school property, on school buses or during any school-sponsored activity. Students 16 years or older can be charged by a Tobacco Enforcement Officer and given a ticket of $305 or issued a summons to appear in court. The maximum fine for a first offence is $1000 for a second offence, $5000. Students under age 16 and found smoking or holding lighted tobacco on school property, can be issued a summons to appear in court with their parent/legal guardian. Students are responsible for maintaining the high standards of cleanliness we set for our cafeteria, halls and school grounds, and therefore are asked to use the litter cans and recycling receptacles provided. 1. Use the cafeteria with care, courtesy and respect for others. Students are to remove their lunch waste from tables when they finish eating. Lunch waste is to be separated according to City of Toronto guidelines into three categories: landfill, recyclables, and organics. Vandalism and defacement of school and property of Mackenzie students and staff is a criminal offence. The TDSB is committed to meeting its obligation under the Canadian Charter of Rights and Freedoms and the Ontario Human Rights Code by providing safe school and workplaces that respect the rights of every individual. Every student, employee, trustee, parent and community member has the right to learn and work in an environment free of discrimination and harassment. Discrimination and harassment based on legislated prohibited grounds will not be tolerated. Such behavior must be addressed not only for its cost in individual, human terms but also for its cost to our social, economic and civic future. Students may be issued a parking permit which will allow them to park in designated areas of the school’s parking lot. To receive a permit, students must fill out a form which is signed by the student and parent/guardian. The student must have a legitimate driver’s license and valid insurance for the vehicle being parked on school property. The vehicle is parked at the owner’s risk and the school/board is not responsible for loss or damage to the vehicle or its contents. The parking permit is non-transferable and all changes of information on the application form will be made known to the office. Report any damage done by, or to your vehicle to the office. Not exceed a speed limit of 10 km/h while on school property. Not use the vehicle as a place to congregate, to eat, study or socialize. Any infraction of the above rules may invalidate the permit and result in the withdrawal of parking privileges, school discipline or police charges. It is expected that all students will attend all classes and arrive in a punctual manner ready to actively participate. Repeated studies of student performance and attendance have demonstrated that student attendance is directly related to his or her achievement. The school’s attendance policy is created in accordance with The Education Act. It is the responsibility of the parent/guardian to ensure their children attend school regularly. Absence from, or late admission to, any class during the school day will be considered truant unless absence is due to a school-authorized activity, a call or a note from a parent/guardian has been received. If a student will be absent from school, the parent/guardian is to call 395-3330 (press 1) before 8:30 a.m. each day to report the absence. Upon the first day of return to school a note must be taken to the attendance office. Students arriving after 8:45 a.m. are to report directly to their period 1 class where they will be marked late by their teacher. Students who arrive after 9:00 a.m. must report to the attendance office for an admit slip. Students arriving late for periods 2, 3, and 4 will report directly to class and will be marked late. All students leaving school before the end of the day must sign out in the attendance office with a note. If a student is leaving a class to sign out, s/he must show the classroom teacher a note. This note must be presented in the office before the student signs out. If a student is absent from school for religious reasons, it is the student’s responsibility to inform his/her teachers and to arrange for access to the material taught in class that day. There will be no one-time-only activities (i.e. major tests) on designated religious holy days as this would exclude students from participation. Phone home through Synrevoice if a student is absent from a class. Student’s cumulative lates and absences will be on all six report cards sent home. Phone home if the student is absent for five or more classes. Arrive in a punctual manner to all classes. Arrange with her or his teacher for any work missed. Ensure their children are punctual and present to all classes. Call in each day for absences (416) 395-3330 (press 1) and to send a note following the absence. Provide a note for absences and prior to early dismissal. Any extended absence is harmful to the academic progress of students. It is the student’s responsibility to complete the work missed as designated by an administrator and teachers during the extended absence. Furthermore, students are to hand in any preassigned evaluations that are due during the extended absence. Students must fill out an extended absence form 10 days prior to the extended absence greater than 4 days. Please consult your Vice-Principal. All students must complete the TDSB’s policies and procedures forms. Parental signatures are required on all forms. Student Data Verification Forms will be distributed to students at the end of September to be returned by mid-October. Follow instructions from staff and remain calm. Do not use any cell phones or personal electronic devices. Fire Drills are held regularly. When the alarm sounds, all students must move quietly and quickly to the exit noted on the classroom bulletin board or wall near the door. Students must move away from the building and clear the exits so that the school may be vacated quickly. Students will return to class when notified by staff to do so. Be patient and do not leave the room for any reason until an administrator has lifted the lock down. Each student will be assigned one locker by his/her first semester home form teacher. Students are not allowed to change or switch lockers. If they do so, their locks may be cut. These lockers are the property of the school and are on loan to students. School staff have the right to search lockers, given reasonable cause. Students must not share lockers or use an unassigned locker. Change Room lockers have been installed to prevent theft. Use them! Do NOT leave valuables on benches in the change rooms! In the TDSB, there is an expectation of fair, consistent and transparent assessment, evaluation and reporting strategies, designed to provide students with multiple, positive opportunities to demonstrate their learning skills and work habits and their understanding of the curriculum expectations. Presenting assignments that have been completed by someone else as one’s own. Omitting quotation marks for direct quotations even if the sources have been cited. All students who face the consequences of plagiarism or cheating have the right to appeal the teacher’s decision to the principal/ vice-principal. Students are responsible for completing and submitting work for evaluation on time. They are responsible for being aware of each due date and the ultimate deadline which is the last opportunity to submit an assignment for evaluation. Sufficient time and notice will be given for tests and for students to complete assignments. 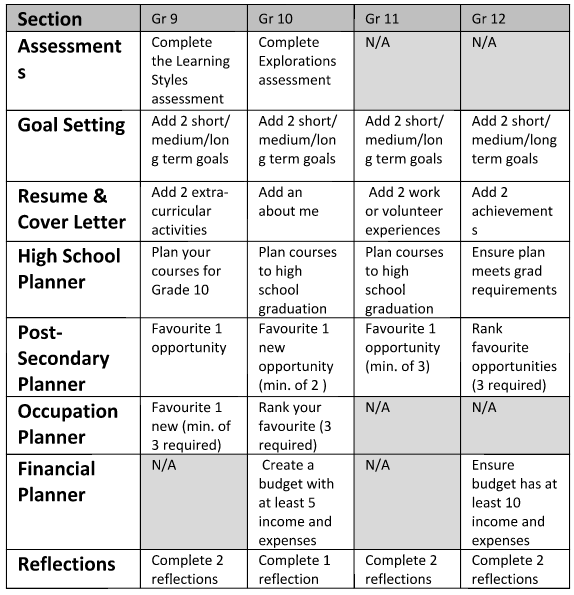 There are a number of strategies to be used to help prevent and/or address late and missed assignments which may be employed by the teacher as outlined in Growing Success page 43. When a number of strategies have been tried, marks may be deducted up to and including the full value of the assignment. If a student is aware that they will miss a scheduled test/presentation they must advise the teacher ahead of time and an alternate arrangement will be made between the student and teacher. On the day of the absence alternate arrangements will be made provided there is parental notification to the office and the teacher that the test/presentation will be missed. Professional judgment will be used by the teacher in determining the evaluation of missed tests and presentations. Students who observe recognized holy days will be accommodated if test and assignment due dates land on the day of or the day after one of these holy days. Students must present a parental note to their teachers prior to the holy day. 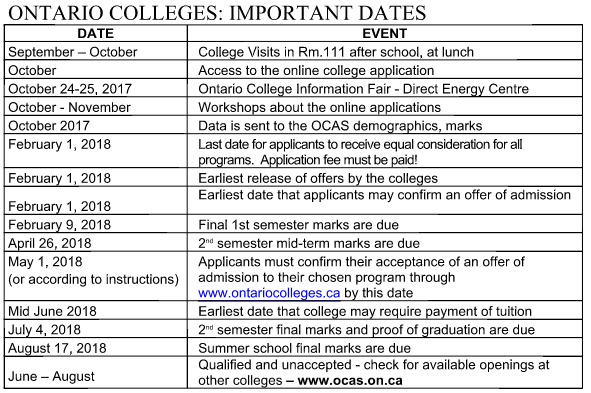 Instructions for Examinations Please check your schedule carefully: Please check for any conflicts and report them to a Vice-Principal immediately. Please check your schedule carefully: Please check for any conflicts and report them to a Vice-Principal immediately. If you miss an exam, you will receive a mark of “0”. Students who miss an exam, due to illness, will receive a mark of “0” unless the student writes an alternative exam, on an alternative date. This will be determined by administration. Obtain a Missed Evaluation Procedures Form from the Main Office. Give the above form(s) to a Vice-Principal within two school days. Academic dishonesty, normally called “cheating”, occurs when there is an attempt to gain or provide an advantage from the work of someone else. Those involved in academic dishonesty – including helping someone cheat – can expect serious academic consequences. All students involved in cheating will receive a mark of “0” for the full work in which cheating occurred, no matter what their role. This policy will apply regardless of when cheating is discovered, whether before, during or after the evaluation opportunity occurs. Plan to arrive at the school at least 15 minutes before the examination begins. No extra time will be given to students who arrive late. For students who are granted time and a half, extra time will still be calculated from the scheduled exam start time. Students who are more than 30 minutes late for an exam must sign in at the main office before going to the examination room. W.L. Mackenzie C.I. offers students many co-curricular opportunities to enhance their educational experience. It is a privilege to be part of Mackenzie’s co-curricular program. However, the successful fulfillment of students’ academic requirements has the highest priority. 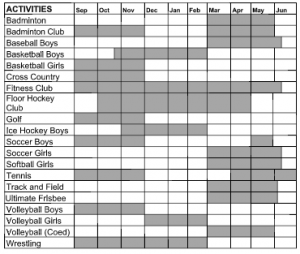 A participant can play on up to two sports teams per season. Participants must demonstrate regular attendance and punctuality in all classes and meet all course requirements (assignments, projects, essays, tests, presentations, etc.). Participants must not have any unexplained absences or lates. Participants must be in compliance with Mackenzie’s Code of Conduct. Participants will comply with the TDSSAA Athletic Code of Conduct. Participants will act as role-models and good citizens of the school. Student-Athletes must be present in all possible classes the day of an athletic activity. If a Student-Athlete is absent from a class for an unjustified reason, or due to illness, they are ineligible to play on that day. Student-Athletes have the responsibility to remind their teachers 48- hours prior to any assessment or evaluation if they will be absent due to a pre-season, league or tournament game. In exceptional circumstances such as play-off games, OFSSA or rescheduled league games, a Student-Athlete may not know 48-hours prior that they will be absent due to athletic activities. In this situation, a Student-Athlete is expected to inform their teachers they will be absent as soon as they find out about the athletic event. It is the Student-Athlete’s responsibility to ensure arrangements for missed assessment and evaluation are made prior to their absence. Student-Athletes are expected to be ready to fulfill the requirements of the assessment/evaluation prior to the athletic activity. In the event of 17 exceptional circumstances, when the Student-Athlete may not be able to fulfill the requirements of the assessment/evaluation prior to an athletic activity, they are expected to be ready to complete the assessment/evaluation the day they return to class. If a student does not adhere to the above-mentioned regulations, they may not be dismissed for athletic activities. Provided a Student-Athlete has been deemed academically eligible according to pre-existing policies and has given their teachers the above- mentioned notice, they have the right to attend all pre-season, league and tournament games for any team they are members of. It is expected that coaches will monitor student attendance. Teachers are expected to report concerns (student absenteeism and academic progress) about student athletes/co-curricular participants in a timely manner to the administration and the coach.If a student does not meet the above criteria, the coach in consultation with the ACL of athletics and the administration, can choose to put a student on an athletic/co-curricular contract. The athletes playing privileges can be revoked at any time if the contract is not being honoured.Administration may remove a student from any athletic/co-curricular activity after consultation with subject teachers/ coach/staff and parents.If a student quits a co-curricular team, they may be suspended from participation in Mackenzie co-curricular athletics for up to 12 months. Suspension length will be determined in consultation with the coach, the ACL of Athletics and the administration. Only students from the “host” or “home” school are permitted to attend. A current student Activity Card with PHOTO IDENTIFICATION is mandatory for entry as a spectator into the competition venue. NO EXCEPTIONS. Parents/guardians and third party adults (scouts, press, other coaches) must obtain a visitor’s pass from the main office. Only students from the competing schools are permitted to attend with supervision from their school. A current Student Activity Card with PHOTO IDENTIFICATION is mandatory for entry. Spectators are an important aspect of school athletic events. The attendance of students, parents, guardians, and members of the community serves to compliment the experience of all those involved in sporting competitions. leave the venue promptly and in an orderly fashion upon completion of the game. Spectators who are unable to meet the above expectations will be asked to leave and may be subject to further discipline according to their school’s Code of Conduct. Every student is required to carry a full course load of four subjects each semester. Students who have an authorized spare may be asked to show to a staff member a copy of their timetable. Senior students on an authorized spare will be allowed to study in the library, cafetorium, or in front of their own locker only. Forty hours of community service is a secondary school diploma requirement. You will not graduate without it. All students must choose TDSB approved volunteer activities and must keep track of their volunteer hours. Volunteer passports are available in the guidance office. Students who have completed their approved forty hours must submit their signed and dated documents (eg. Community Involvement Passport or a letter stating time and place of the activity) to the guidance office. Students are responsible for keeping duplicate copies of these documents. 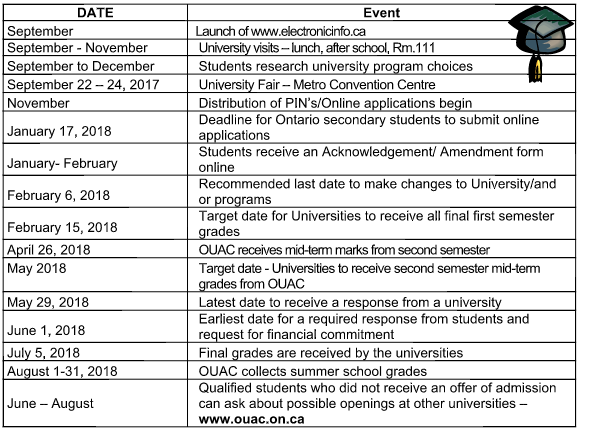 The education and career/life planning program policy for Ontario schools is based on three core beliefs, namely, that; all students can be successful; success comes in many forms; there are many pathways to success. Review the requirements for your grade, and click on your progress meter to view this year’s requirements. the police at 416-222- 8477 (TIPS). The caller will never have to testify or give his/her identity. Below are other important numbers. The school number is 416-395- 3330. 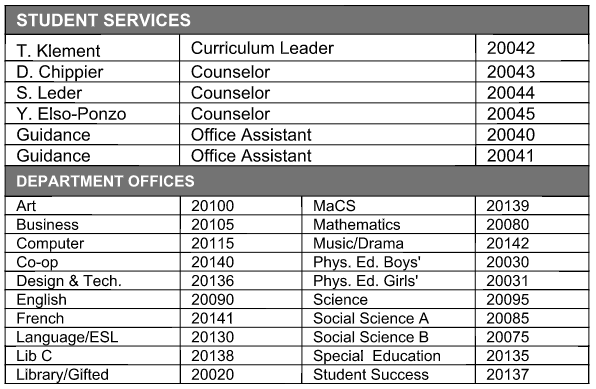 School extension numbers for guidance counsellors and departments are listed below. The library provides you with space and resources to help you learn and complete your school work. If you are in the library with your class, please respect the needs of others for a quiet, reflective space. If you are in the library while on a spare, please respect the needs of the class and understand that the teacher present may need to provide direction to students during this time. 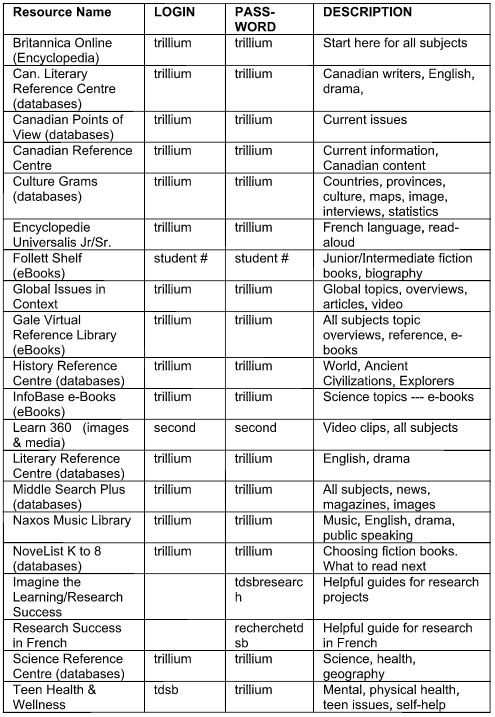 The Library is equipped with digital resources. The lost and found is in the main office. Any items of value lost or believed stolen, should be reported to the main office. Remember not to bring valuables to school. Where can I get a parking permit for the school lot? All students who drive to school must complete a parking permit application. Applications are available in the main office. Please note that parking in the school lot is a privilege that may be revoked. Music from parked cars should not be disruptive to classes. Drivers must drive slowly, cautiously and responsibly while in the parking lot. Smoking is not permitted in vehicles while in the parking lot. Can my parents call me while I’m in school? Students are to advise their parents or guardians, that except in emergencies, messages will not be relayed during the school day. Can I use the phones in the office? Please note, except for emergencies, office phones are for school business only. Pay telephones are located outside the student cafeteria and are for student use. What is the school’s website? Please check our newly designed website for course descriptions, exam schedules and school updates. This website was created and is managed by students and staff. Does the school use Twitter?